They said it couldn’t be done, but we did it! After 40 years in the fireproofing business searching for a better solution, we solved the three biggest issues affecting the patch and repair of existing fireproofing. With UFP, 1) the high cost of patching and repair is reduced by more than 50%, when factoring in labor and materials, 2) spray equipment, certification, and multiple worker teams are no longer needed, 3) it works! UFP is fully vetted by independent laboratories, and performs superior to any other coating. Current regulations require that any fireproofing patching must be completed with the exact same coating that was originally installed. If you’re working with a new application, where the material (and manufacturer) are known, by all means contact the manufacturer and follow their repair procedure. If the exact material is unknown, no longer being manufactured, or for some reason unavailable, what do you do? Removing the coating from the entire beam and re-spraying it is certainly one option, however this will come at a cost with a whole bunch of zeros. Since there has been no acceptable procedure for patching under unknown conditions, the incentive has been great to just make the problem go away. Before UFP it was commonplace to scrape stuff off the floor, use taping compound, anything—just to make the problem disappear. When it comes down to it you can feel good about using UFP because it works. And when you’re responsible for doing a job that has the potential to save lives, there’s real comfort in that. 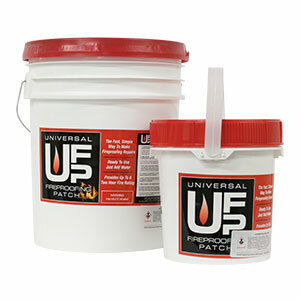 Unlike any existing fireproofing patch solutions, UFP adheres optimally to dry coatings, performs thermally equal to or better than any existing SFRM, and has been approved against both medium and commercial grades of fireproofing, fiber or cementitious, for up to 3 hours of protection.